Hand-arranged to order by our skilled florists, the Tulip and Freesia Bouquet is guaranteed to make them smile. Featuring only the freshest Tulips, Freesia and Solidaster, this bouquet will bring vibrant colour and a sweet fragrance to any home. To make this bouquet even more special we will add in a Handwritten Card, a box of luxury Lily O'Briens Chocolates and a chic glass vase. Send this wonderful gift set to loved ones on birthdays, anniversaries or any other special days. Free next working day delivery is included as standard. Your flowers and gift items will be delivered in our special delivery box to prevent damage while in transit, so they arrive in excellent condition all for just £49.99! For that extra special personal touch, why not a second box of delicious Lily O'Briens Chocolates or an adorable teddy to accompany your beautiful fresh hand-tied Tulip and Freesia Gift Set bouquet. 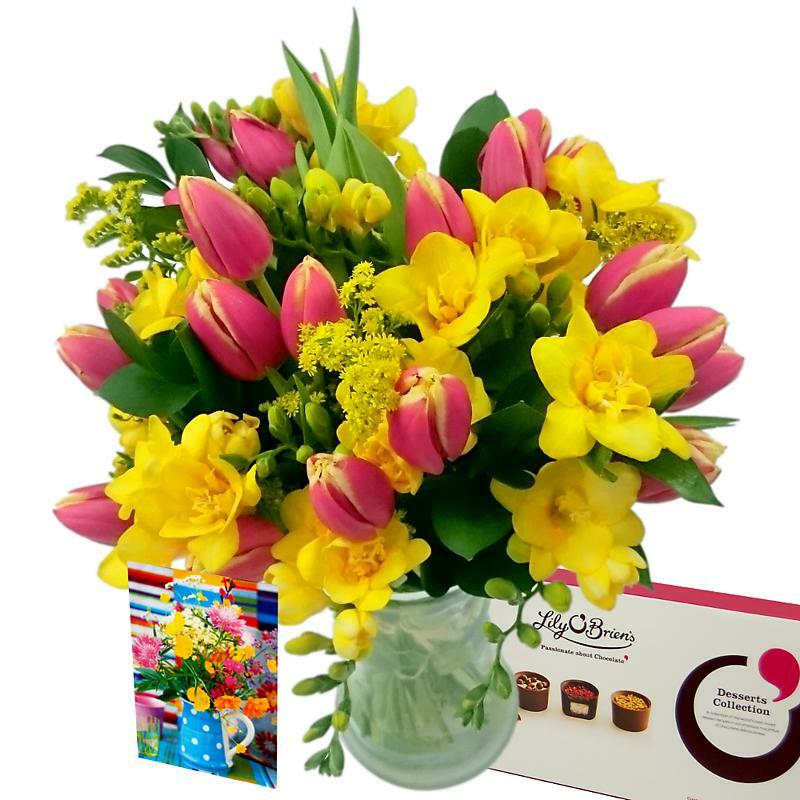 We also have the Tulip and Freesia bouquet available on it own as well as a large selection of arrangements containing tulips as well as freesia and an array of different gift sets to suit every occasion. Go Deluxe! Choose this option and our expert florists will DOUBLE the amount of fragrant freesia in your bouquet for only Â£5.00! No deliveries are possible on Bank Holidays.